Yes, I know. It’s been done. Overdone. But not by me. When I needed to throw together a quick lunch for the four of us, I saw the enormous California strawberries sitting on the top shelf of my refrigerator. Without thinking about it, I found myself throwing together one of the great food combinations I have heard mentioned repeatedly over the last few years, but had yet to sample for myself. Like lavender ice cream and chocolate covered potato chips, the strawberry/basil/balsamic combination was on my list of must-try dishes. It was, as I’d imagined, pretty darn fabulous. Bewitching. I think it’s my new favorite salad. Shhhh…don’t tell anyone. I really don’t like doing what everyone else is doing. 😉 But never fear. I will NOT be trying the latest rage, chocolate covered bacon. This salad is such a no-brainer that I am not going to post a recipe, but here is how I made my salad. 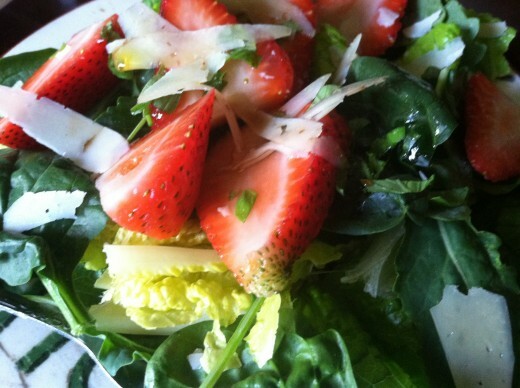 On a bed of organic spinach, romaine, and baby kale, I placed slices of enormous strawberries (that lacked in flavor what they flaunted in size and color). I then drizzled on a bit of organic balsamic vinegar and extra virgin olive oil. 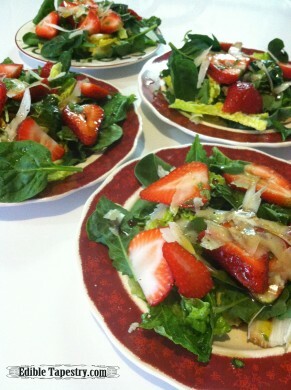 I sprinkled basil chiffonade on the strawberries and dressing. Then I shaved parmesan cheese over the basil. Great recipe. I need a good refrigerator strawberry jam. I’m picking a large colander full of strawberries every day. Also have lots of different lettuces in the garden to try with this. Love this blog! Um…you’ll never BELIEVE what I’m making tomorrow. Freezer jam. Remember the raspberry freezer jam on Bainbridge Island? I’m trying to decide if I’m making raspberry, strawberry, or mixed berry, including blueberries, for our tailgate market this weekend. SO glad you like the blog! Great! Post recipe. Tailgate market? Like a farmer’s market? Every weekend? Hm, I need to visit.